Move over small tanks, kiss goodbye to stealth vaping and adios portability. The Steam Crave Aromamizer Titan RDTA found its way to me. 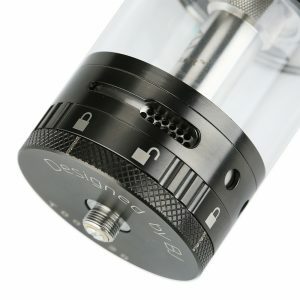 Steam Crave have never been shy to produce what I would consider larger capacity tanks. 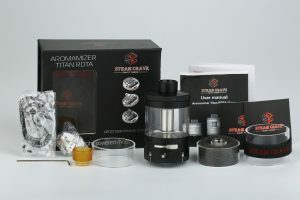 We saw the Aromamizer supreme and plus tanks bringing 20ml tanks to the market and now the latest offering is the Titan. 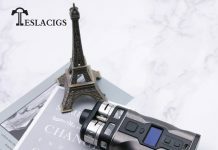 The Titan is by looks the bigger brother of the Aromamizer plus. Its an absolute monster and with the right setup its far from a gimmicky giant sized tank. Lets take a closer look. Thats a whole lot of goodies to play around with all in one box ! Getting the Titan out of the box I was immediately overwhelmed with the sheer size of the thing. It is an absolute mammoth sized tank. Its like giving a massive middle finger to the UK regulations of measly 2ml tanks. The Titan measures in at a staggering 71mm (h) and 41m (d) and out of the box its a 28ml RDTA. There is also a smaller but still oversized 18ml glass conversion kit included in the box. 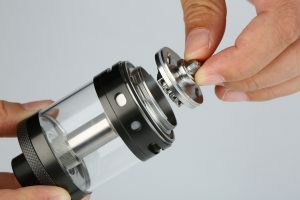 Finally by using no glass at all you have a 5ml RDA option too. 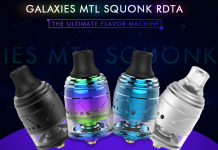 The lure of the Titan for me personally was the fact that there are a few e-juices recently that I cannot get enough of and rather than decant larger bottles into smaller unicorn bottles I figured this was going to give me a good couple of days vaping on some of these juices. So immediately I set about getting this set up. I opted for the postless deck option initially. A) because it looked easy to build on and B) I am not known for being patient and wanted to get on this as fast as possible. So in went some nice alien coils ( I recalled from previous reviews that it was rather luke warm with standard builds ). Next up the wicking making sure to just cover the juice flow holes and cracked open some I VG apple berry crumble. Juiced up and rebuilt the Titan ready for an epic fill up. Taking apart and rebuilding this was a breeze. Like the rest of the aromamizers the Titan is so well machined that everything just unscrewed with ease. Juice flow control and airflow ring were equally as smooth, due to knurling on key parts. Back to the airflow for a moment. As expected from this beast the airflow is huge, fortunately here there are a few options. A smaller ( but still large ) circular hole, a medium ellipse shaped hole, long thin slot style hole and finally full throttle giant sized hole. Many options for finding that perfect airflow. Channelling of the airflow ensures that the Titan and your build does not become too hot. Finally I got to vape on this and was struck with just how much flavour I was getting. I VG Apple berry crumble is one of my favourite juices out there right now and is almost a benchmarking flavour for new tanks and rda’s. I was very impressed with what I was getting. Aside from the flavour the cloud production as akin to a fog machine ! Cloud production was definitly increased. Airflow I started on the smaller hole and worked through the options. Finally settling on the slot shaped option which gave enough restriction for a nice comfortable warm vape. I am very impressed with the Titan as a whole. Its now time to look for a mod for it to fit on with 0 overhang. Currently the only options I can see are the Hammer of God or a Laisimo F4 expect to see one or the other on my social media at some point in the future. This is totally me. The Titan is an eye catcher, a talking point. I normally find myself drawn to gimmicks and to be disappointed, Will I ever learn? However gimmick this is not, probably contender for one of my favourite RDTA’s. Juice capacity keeps me going for a good day and a half which is scary because you can see just how much you are vaping in a short time. I have not experienced any leaking through normal use. One time I forgot to close off juice flow when filling and boy did it leak but currently its been sat for 2 days unused and no sign of leaking. In conclusion its not for everyone of course. The size for some will be off putting. A point to note which I briefly mention above is that its not a tank for small builds. In my opinion the airflow regardless of setting will give a disappointing experience so stick to bigger builds. Finally I forgot to add above filling is a joy. Fiddling around with top fill with small fill holes is a thing of the past. Most of all you can literally pour straight from the bottle and of course no problem for those larger twist style dripper caps. Keep scrolling for the pros and cons. These will be below with my final rating. 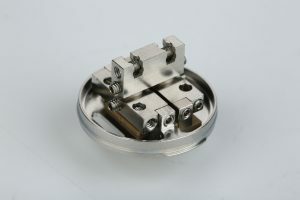 Pros - Capacity, Ease of Building, Flavour, Cloud Production, Quality of Machining and Looks. Cons - Lack of mods available. 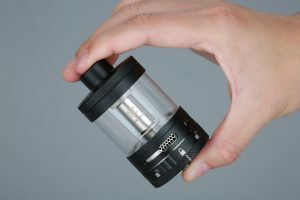 Wotofo Faris RDTA Review – A 2-in-1 Atomizer!